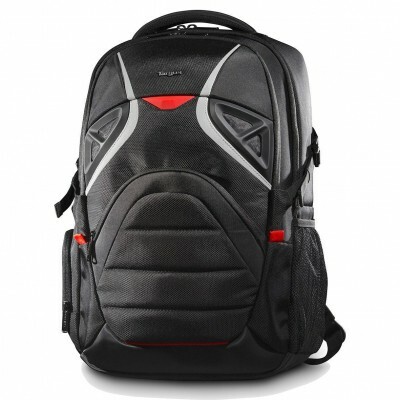 Introducing the Targus Strike Gaming Backpack. The first backpack designed specifically for gaming by the number one brand for laptop protection on the go. With a durable nylon exterior, robust padded laptop compartment and reinforced base to protect your tech from impact. This bag features an oversized dedicated laptop section to fit massive 17.3â€ gaming laptops or consoles as well as multiple labelled pockets and loops for easy storage of gaming kit including mouse, keyboard, hard drive & headphones. Padded top handle, shoulder straps and ventilated back padding ensure comfort on the move while reflective strips and an integrated reflective rain cover increase visibility. Thereâ€™s even a hidden pocket in the back padding for your ultra-valuables.